When Chance’s friend Kathy, an underground San Francisco enforcer, vanishes, he’s commissioned by her employer to find her and bring her home. Kathy’s new girlfriend Jessa, a reformed drug addict and prostitute, tells him Kathy abruptly packed a bag and headed home to take care of a family matter, but doesn’t know where that home is. Kathy’s boss, a Castro District nightclub owner, drug dealer, pornographer, and pimp, neglected to mention at the same time Kathy went missing, an up-and-coming MS-13 drug lord was trying to take over the club. Or that he’d sworn to dismember Kathy with a machete. Not that it would have mattered. ‘Machine Gun’ Kathy once saved Chance’s life, and Chauncey Means is a man who pays his debts. The search leads him to Lumberton, North Carolina, one of the most blighted, gang-infested, rural towns in North America. There, as a tropical storm bears down on the region, Chance is forced to dodge merciless Mara Salvatrucha killers, and the local authorities, as he tries to locate his friend. If she’s not already dead, that is. To find her, Chance must unravel the mystery of Kathy’s past. A journey which takes him into the darkest recesses of a family’s long-buried, and most sordid, secrets. "Using his experience as a police officer, Sean Lynch spins a tale that is fast, fun and realistic. 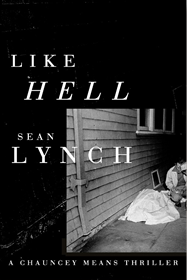 Like Hell is a great read."